I don’t mean as a direct alternative to that dried fruit pudding English people have after Christmas dinner (which I now love, I actually made my own two years ago for the first time and make them a year in advance now). But I mean, something to eat for pudding on or around Christmas Day. 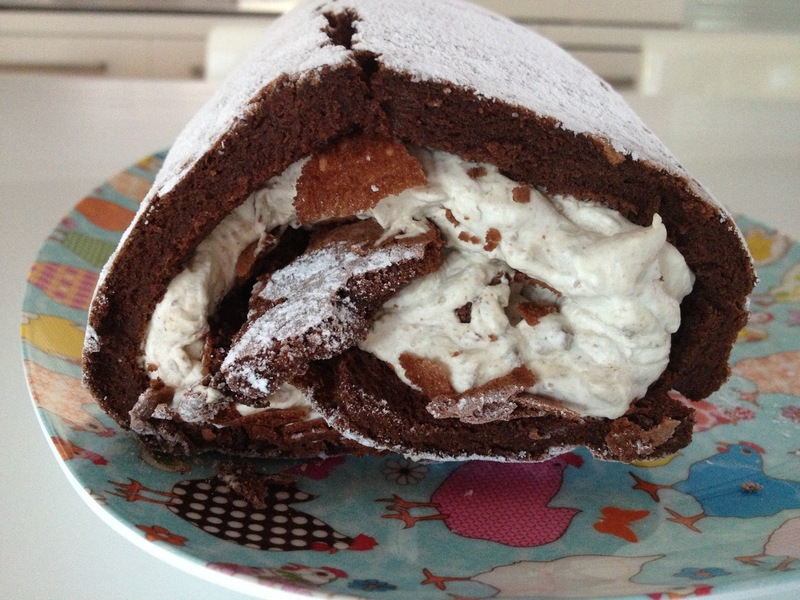 Every Christmas I make this amazing Chocolate Chestnut Rum Roulade. It’s an Icelandic recipe that I got from the Waitrose magazine twelve years ago. It is so good. I make it every Christmas and my eldest asked for it for her birthday this year. It’s really not that difficult, can be made ahead and put in the fridge. 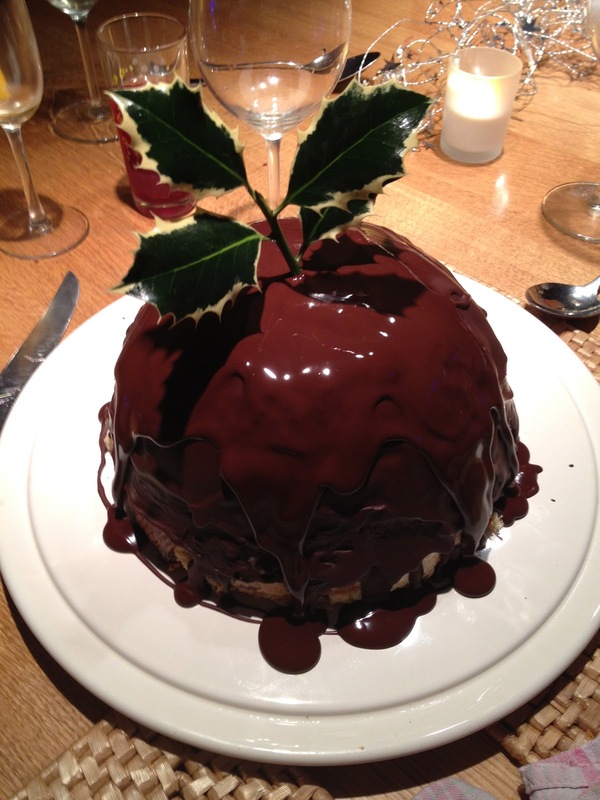 Another thing I make is Jamie’s Winter Pudding Bombe. This is superb made in advance and stuck in the freezer. I do make some changes to this as the clementine he asks for just freezes solid (obviously) and I don’t find it very nice to eat. So I do his recipe but instead of the bits he asks for I add some dark glace cherries, some candied fruits, some sour cherries soaked in marsala (I use marsala instead of vin santo throughout) and then some toasted pistachios and hazelnuts. I think you could easily customize this bit. I also use home made vanilla ice cream because it’s tastier and cheaper. The quantity in that recipe I’ve linked to make the perfect, perfect amount for this recipe. Need I point out that you don’t use expensive panettone for this. You can make it in advance, as I said, and then just turn it out when you want to serve it, and pour the chocolate over the top. 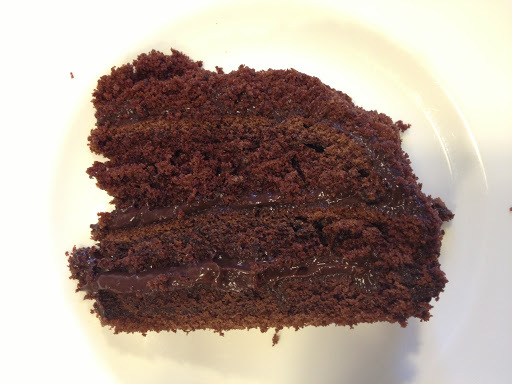 Annie Bell’s Blackout cake, as near to chocolate cake perfection as possible. Lastly, for something that doesn’t look as festive but is really, really delicious. Annie Bell’s Brooklyn Blackout cake which is as close to chocolate cake perfection as I can take you. I guess you could make it more festive with gold leaf or something. I don’t know, up to you. It’s sensational however and once people start eating it they won’t care if it looks festive or not. Do feel free to share your Christmas pudding alternatives. update: mid January 2013. 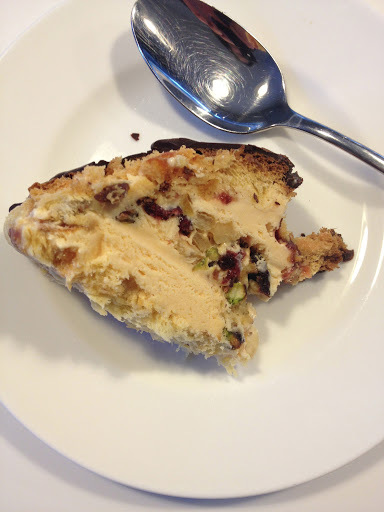 We just at the last of the bombe, which had been nestling in the freezer since I made it on 21st December. I thought you might like to see inside. It was still really really good. This entry was posted in Celebration, Chocolate, Christmas, Ice cream, Parties and tagged candied peel, Christmas pudding, ice cream, panettone on December 19, 2012 by Annalisa Barbieri.